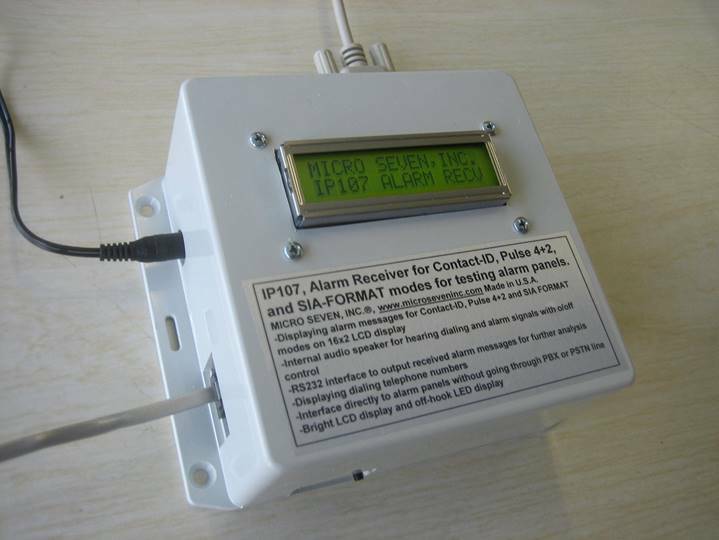 Micro Seven, Inc. ®, models IP107 contains Alarm-Receiver/Simulator WITH INTERNAL LCD DISPLAYS FOR DISPLAYING RECEIVED alarm messages for Ademco contact-id, PULSE 4+2 AND SIA FORMAT. IT ALSO CONTAINS RS232 INTERFACE AND AUDIO SPEAKER FOR HEARING ALARM REPORTING PROCESS. IP alarm receiver option is also available. Micro Seven, Inc. model IP107 contains Alarm-Receiver Simulator and telephone line simulator function which does not require telephone line to test and troubleshoot alarm panels for Contact-ID, pulse 4+2 and SIA-FORMAT protocols. The Alarm-Receiver Simulator function provides simulated telephone-line that includes loop voltage/loop current, call progress tones, and DTMF tone receiver for recognizing dialing by alarm panels. The simulated telephone-line functions also include generation of dual-frequency-type call progress tones, handshake signals for all three protocols and kissoff tones. Traditionally, when alarm panels are tested in the manufacturing, an alarm receiver with telephone lines is required. The Micro Seven model IP107 provides both simulated telephone lines and alarm receiver in a box so that your alarm panels are connected directly to IP107. Connect your alarm panel to the RJ11 connector of IP107 with a regular telephone cable. Create an event at your alarm panel to report alarm condition. When your alarm panel goes off-hook, “OFF-HOOK SIGNAL” and “DIAL-TONE ON” are displayed on LCD displayed on IP107. Throughout testing, all received and transmitted signals are heard from audio speaker as factory default. It may be turned off by pushing a push-button switch on IP107. A red LED on side of IP107 is turned on when telephone line input goes off-hook. Note: actual display area is 1”(2.5cm)x2.75”(7 cm). When the alarm panel is dialing a telephone number such as a toll-free 1800-555-1212 for your alarm panel, “DIALING” and “18005551212” is shown on the LCD display. IP107 accepts any telephone number for alarm receiver function unlike correct telephone numbers are required to be dialed at a line when the line is programmed as a telephone line simulator not as an alarm receiver. Since the alarm receiver is internal, there is no ring signal generated. IP107 waits one second at the end of dialing process. Then it generates ring-back tone at the line displaying “RING-BACK TONE” on the LCD display. There are two ring-back tone periods. Then IP107 generates the handshake tones with 1400 and 2300 Hz displaying “HANDSHAKE TONES” on the LCD display. Then your alarm panel transmits sixteen-digit digital alarm message to IP107. There are two displaying modes. One mode displays raw sixteen-digit alarm messages on the LCD display. The other mode displays decoded alarm messages including alarm code, description of alarm code, account number, new/restaural/status, zone, and partition number. The raw message mode displays “KISS OFF/MESS.RECV” and “567818111012223” on LCD display. If it is the decode message mode, the display is “110 Fire Alarm” and “A:5678 New/Open”. Where 5678 is account number and the “New/Open” is the type of message. The display may also be either “Rest/Clos” for 3=New Restore or Closing/or “ or Status Rp” for 6=previously-reported condition still present (Status report). Note: Selection of decoded message or raw message mode is done by IP107PROG.exe. The factory default is decoded message mode. The bottom portion of the display is then changed to : “P:12 ZON/USR:222” which indicates the partition=12 and the zone=222. The bottom portion of the display changes for every second between the account number with type of message and partition with zone numbers. Twelve maximum characters for each event code is displayed at 16x2 LCD module. Maximum twelve characters are only displayed on the above LCD display for a decoded event code. If there was no alarm message received and IP107 goes on hook, it display “ON-HOOK” shown as below. If the checksum in the alarm message is wrong, the “BAD MESSAGE" is shown as below with the received message. Dialing into alarm receiver: It accepts any numbers of any DTMF digit when any telephone number mode is enabled or by the factory default condition, but the maximum pause time between digits should be less than one seconds. The maximum dialing digit is sixteen. Dialed numbers are shown in the LCD display. 1400: 1400+/- 1Hz, -20 dBm nominal power, -30 dBm power in the line impairment mode, duration of 100 ms +/- 1.5 ms.
1400+/- 1Hz, -20 dBm nominal power, -30 dBm power in the line impairment mode, duration of 100 ms +/- 1.5 ms.
Alarm receiver software: Window-based software is provided with IP107 for further decoding alarm messages with date/time information. Also, all received alarm messages are stored in a disk file as continuous file. The software may be able to transmit emails into Internet when alarm messages are received at PC. All communications via PC are done at RS232 interface. Alarm message length register with EEROM address FD: hexadecimal 10 for Contact-ID for decimal 16, input command “MFD10” at RS232 interface using Hyper-terminal. PBX mode is available for alarm receiver mode. RS232 interface, 115200 baud, eight bit data, no parity, and one stop bit format for outputting received alarm messages in real time. Standard dual-frequency call progress tones, nominal -16 dBm. Ring-back Tone: 440 Hz + 480 Hz, 2 sec ON/4 sec OFF. Busy Tone: 480 Hz + 620 Hz, 0.5 sec ON/0.5 sec OFF. The selection between dual frequency call frequency and single frequency type is done by control software. Stutter dial tone: The stutter dial tone with three of 0.1 seconds on/off period following with continuous dial tone. Warranty/Service: 6 months limited warranty. No warranty if any factory seal is broken. Service is performed at the factory, usually within 5 working days. SIA Pulse Format P3 in SIA DC-02-1992.02 (R2000.05), section 4.1.3 Pulse Format P3 is provided. Note: IP107 generates kissoff tone for 4+2 mode first. If there is no 4+2 communication for four seconds, contact-ID handshake is generated. Four digits for account number, one digit for event, and last digit for zone. One period consists of 1900 Hz on for 25ms and tone-off for 25ms. Handshake signal: 1400Hz tone for one second long. Kiss-off tone: 1400Hz tone for one second long. Double transmission is required for generating kissoff tone. Note: similar decoded message display in Pulse 4+2 mode is also provided. 1095-K N.E. 25th Hillsboro, OR, U.S.A.